The two coins on this page are both silver coins, they have the same monetary value. Yet one is 1 franc and the other is 100 francs. Before the Euro, the currency of France was the franc. In the 1960s there were old and new francs, you could spend both. One new franc was worth 100 old francs. After 1963 prices and bills were in new francs, but the French talked and thought in old francs. Confusing? For the tourists, yes. What happened to the franc? The franc lost value from the early 1900s to the late 1950s. A franc in 1904 would have the same value as 230 1958 old francs(1). Britain's days of high inflation were yet to come. The British pound from 1904 would be worth �5 in 1958. 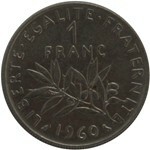 President De Gaulle introduced a new Franc (NF) on 1 January 1960. It was worth 100 old Francs. It was meant to restore prestige to France's currency. Finance Minister and later President, Val�ry Giscard d'Estaing, said it removed the scars of the past from the French money system (2). The transition did not happen overnight. Prices in the shops showed both old and new francs and the old coins still circulated. The French Mint was slow to issue the new coins and notes. The French were slow to take to the new franc. Speaking in 1963, Val�ry Giscard d'Estaing admitted to stilling thinking in old francs (2). Shopkeepers and waiters made out bills in new francs, but talked in old francs. In 1963 France dropped 'old' and 'new' labels. There was one franc, the new one. Old francs were still legal tender, but became centimes (100th of a franc). French people still talked and thought in old francs or 'ancien francs'. They often said mille francs (one thousand francs) to talk about quantities in old francs. For the tourist, it must have been hell. £1 was worth 13.82 francs in 1960. It was a fixed exchange rate. It made the new franc worth 1 shilling and 5 pence in the pounds, shillings and pence system. A franc and a shilling were about the same size and weight.